You don’t have to be a scientist to be fascinated with insects. These little creatures are all around us but so many people don’t know more than just a few of them. Mini-Monsters for iPad can serve as an educational tool for those of you who want to experience the world of insects, bugs, and other small creatures. 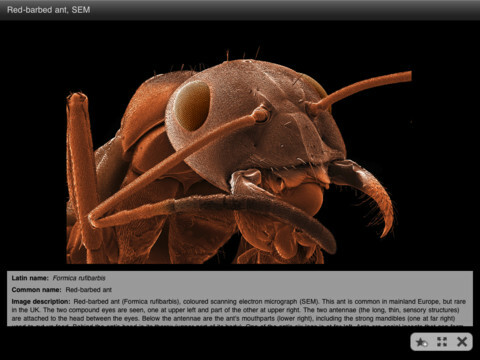 Mini-Monsters contains more than 500 stunning photos of small creatures all around us. This tool gets you as close as possible to these mini monsters. It is fully interactive and has scientific caption under each image. 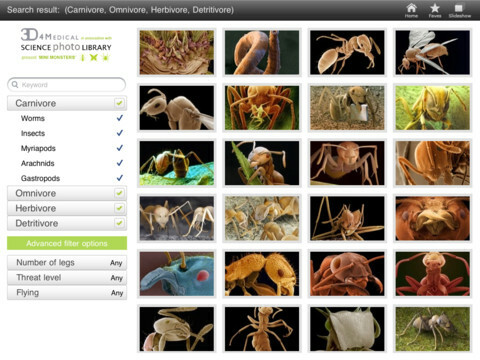 Mini-Monsters has a cool search feature that lets you find the types of creatures you are looking for faster. The A-Z index is another way to search through the creatures. Mini Monsters not only lets you search through all its photos, it also handles your favorites. Watching these photos in full screen format is simply a stunning experience. The descriptions on these creatures are nice to go through. Overall, Mini Monsters is another one of those must-have educational apps for iPad.